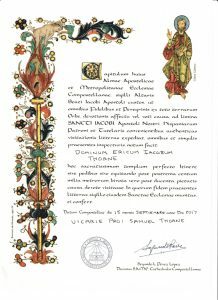 Camino Frances – Campaign for Samuel Inc.
Eric walked the Camino for Samuel whose name also appears on the certificate. 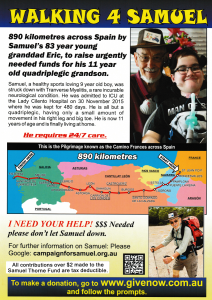 Completing his first Camino Frances across Spain at the tender age of 75 and his second at 80, Samuel’s 83 year-old Poppy, Eric, was determined to complete the pilgrimage for a third time to raise awareness of Transverse Myelitis and Samuel’s condition. Donations can still be made through www.givenow.com.au/samuelthorne . Eric, suffering from an unexpected chest infection on his way to France to begin the walk, battled on regardless and while not walking as much as he wanted, fulfilled the requirements to receive his third Compostella de Santiago. Samuel’s Poppy is dedicating his third Camino Frances pilgrimage to Samuel.